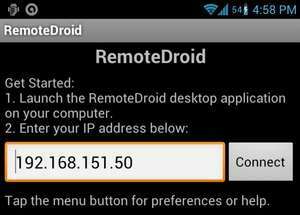 RemoteDroidServer is a client-server application for controlling your personal computer from virtually any Android phone. You can perform tasks faster from your PC than you can from a touch screen phone such as text messaging or email. In this case, you can download the server here which is installable on your PC. Then from your Android phone, grab the RemoteDroid Client from the Google Play market. For security reasons, you should also check out the RemoteDroidServer download at LO4D.com which includes virus and malware tests. Additional screenshots of this application download may be available, too.